Spotted Joe-Pye weed, hollow Joe-Pye weed, and similar plants are "weeds" only in the sense that they are wild plants (in North America). "Wildflowers" would be a better name for plants with such an attractive flower and stately form. Learn how they are classified and used in the landscape. Plant taxonomy places the various types of this plant in the genus, Eupatorium (you will also encounter the names Eupatoriadelphus and Eutrochium in your research, thanks to taxonomic changes over the years). Spotted Joe-Pye weed (Eupatorium maculatum) is an example of a species. Joe-Pye weed is considered a broadleaf, herbaceous, perennial wildflower. It is a member of the aster family. Joe-Pye weed has fuzzy flower clusters (mauve or white) and an imposing presence (6 feet tall or more). The stems are sometimes spotted (on E. maculatum) but also often come in a solid purple that offers an even more striking look. These sturdy stems make it a good cut flower. Its flower heads are flattish; its leaves grow in whorls and are lance-shaped. It eventually spreads to form a dense stand. A wet area in the landscape often presents a challenge to the homeowner: Many plants will not perform well there. At home in wetlands in the wild, Joe-Pye weeds are a good choice when you need plants for wet soils. They are plants that attract butterflies, including tiger swallowtails and black swallowtails. Indigenous to eastern North America, the plants can be grown in planting zones 4 to 8. Grow these wildflowers in full sun and in moist ground. A friable, loamy soil will yield stronger growth, but they are also clay-tolerant plants. Because it is a tall perennial, it is effective in the back row of a flower bed (in a cottage garden, for instance). At the center of a planting circle surrounded by shorter plants, this highly architectural specimen can serve as a focal point. In addition to its beauty, the plant has another selling point: It is a late bloomer, flowering in late summer and into autumn, well after most other plants in its native region have ceased flowering. As such, it can be a useful plant to grow if you wish to stagger blooming periods in your yard, as you should be doing if your goal is landscaping for the four seasons. Finally, given its native status in eastern North America, it is a natural choice for native-plant lovers looking to fill a space in a native perennial sun garden. If you wish to keep it in check, you will have to contain the spread of the rhizomes either by cutting them or by blocking their progress with bamboo barriers or the like. If you are happy with this aggressive plant and want more of it, leave it alone. You can even divide it in spring and grow it in an additional spot in the landscape. Pinch the plants back in late spring to keep them more compact. 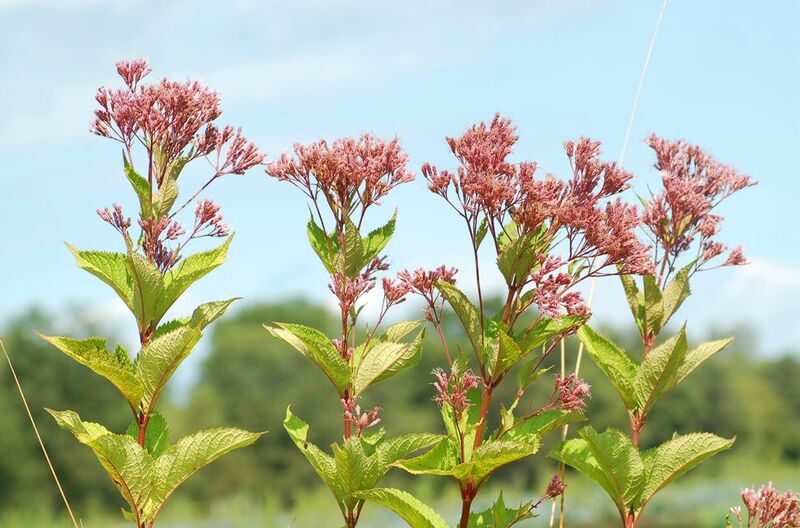 Joe-Pye weed is a wildflower, but cultivars of Eupatorium are also available. Besides the mauve-flowered kind, some gardeners plant white-flowering types such as Eupatorium purpureum Joe White, a type of "sweet" Joe-Pye weed. The existence of white-colored types should not surprise those familiar with the related wildflowers, snakeroot (Eupatorium rugosum) and boneset (Eupatorium perfoliatum), both of which bloom in white. E. rugosum Chocolate has white flowers; its cultivar name derives from the dark splotches in its foliage. For blue flowers, try another relative, the Ageratum look-alike, blue mistflower (Conoclinium coelestinum). Hollow Joe-Pye weed gets its name from the fact that its main stem is hollow. In The Book of Perennials (p.150), Alfred C. Hottes states that the genus Eupatorium was named "for Mithridates Eupator, King of Pontus, who discovered a species to be an antidote against poison" (others say that the species in question was, itself, poisonous and that Mithridates consumed it in small doses to build up a tolerance to it). On the same page, Hottes notes that the common name for E. maculatum, etc. "is derived from Joe Pye, an Indian herb doctor of Pilgrim days in Massachusetts. He is reputed to have cured typhus fever from a decoction of the plant." Meanwhile, the species name, maculatum is Latin for "spotted" and refers to the fact that spotted Joe-Pye weed often bears purplish flecks on its stems. Do Goldenrod Weeds or Wildflowers Really Cause Allergies?